#lis_rival brought together 33 delegates from a range of stakeholder groups including academic, health, national, prison, public, and special librarians, as well as LIS academics, officers from the Chartered Institute of Library and Information Professionals (CILIP – the main UK professional body for information and knowledge workers), and independent consultants. Over the past few days Bruce and I have been pulling together the resources created for/on the day – notably photographs, and video footage of presentations – and analysing delegate feedback on the event. We have also been dealing with the usual post-event admin, such as thanking everyone who supported the work that went into such a successful gathering, and paying our bills. Now that this is done, we are able to reflect on the work presented at #lis_rival, and possible future initiatives that may emerge from the many discussions amongst the delegates on the day. The aims of #lis_rival were to bring together library and information science researchers, librarians, and other library stakeholders to: (1) explore concepts and examples of the impact and value of LIS research to services delivery in practice; (2) encourage the strengthening of links between these interacting communities; (3) narrow gaps between LIS research and practice; and (4) lay the ground for future research-related support and collaborations across the sector. In the advertised programme we also promised ‘contributions on the impact and value of past investments at national level to support LIS research in the UK – notably the Library and Information Science Research Coalition (2009-2012) and the Developing Research Excellence and Methods (DREaM) project (2011-2012) – and new proposed initiatives to provide the necessary infrastructure for future support in the field’. Paul Gooding, Andrew McTaggart, Sara Wingate Gray and Stella Wisdom delivered short presentations on current and recent LIS research projects in which they are involved, with a focus on the value and impact of such work. Yvonne Morris‘ short presentation and Alison Brettle‘s longer closing keynote speech made reference to current and future initiatives to support LIS research: CILIP’s research and evidence base portal, and a joint UK research council funding bid by Alison Brettle and Hazel Hall – supported by CILIP – to establish a network to develop research skills within the LIS community through systematic reviews of the librarainship literature. 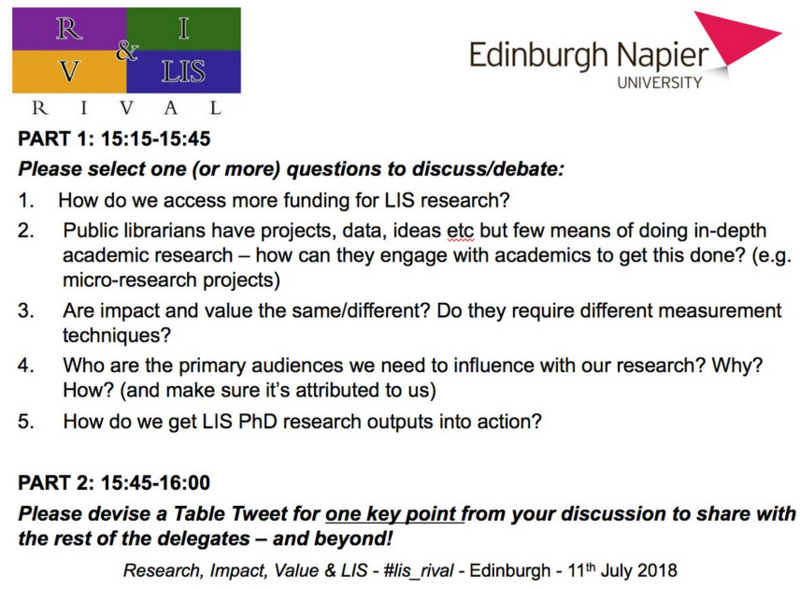 My own presentation ‘Conceptualisations of LIS research impact and value: Learning from the LIS Research Coalition and DREaM‘ outlined the impact and value of past investments at national level to support LIS research in the UK. This included reference to the paper ‘Long-term community development within a researcher network: a social network analysis of the DREaM project cadre‘, recently published in the Journal of Documentation. All but one of the presentations are available on SlideShare in a large single file. Stella’s presentation is available separately. My own presentation is available in the large single file, and also separately. Individual PDFs of the slide decks can be downloaded from the table below, as can video footage. We were also keen to encourage the strengthening of connections between delegates at the event, not least because (unusually for a meeting of this small size) it brought together such a diverse range of stakeholders. We therefore provided slots for ‘unstructured’ networking with half an hour for coffee/tea at registration and a full hour for lunch, and a 45 minute tea break in the afternoon. The latter also offered delegates the option of a short guided tour of the Edinburgh Napier University War Poets Collection. In addition we encouraged delegates to contribute to the agenda for the afternoon by suggesting topics for 45 minutes of group discussion in the last session before Alison Brettle‘s closing keynote. These suggestions were recorded on ‘ideas cards’ over the course of the morning sessions, submitted to ‘the spotty bag’, then reframed as discussion questions by the organisers during the lunch break. The spotty bag was also used to collect delegate badges at the end of the day. This was mainly so that we can recycle them for other events. We also used the badges to make a prize draw for two books on LIS research donated to the event by Facet Publishing: Research, evaluation and audit edited by Maria J. Grant, Barbara Sen and Hannah Spring; Being evidence based in library and information practice edited by Denise Koufogiannakis and Alison Brettle. The lucky winners were Fred Saunderson of the National Library of Scotland and Becky Willson of Strathclyde University. The analysis of the comments provided in the survey returns show that the delegates appreciated most of all the variety of the programme (including the opportunity to visit the War Poets Collection) and the diversity of delegates. They also remarked positively on the ‘very welcoming atmosphere’, opportunities for networking, and noted that the event was well organised. There were a couple of comments that referred to the over-ambitious nature of one or two of the short presentations, with suggestions that the presenters could have done more to tailor their content and edit their slides accordingly. On the basis of two comments, we might have considered a more structured approached to networking and the delegate-led discussions. We also appreciate that 11th July was a very sunny day in Scotland and that the bright sunlight leaking in through the blinds sometimes made it difficult to read presentation slide content. The feedback demonstrates a clear appetite for further events such as #lis_rival, with one delegate suggesting that he/she could host a follow-up at his/her university (although, since the surveys were completed anonymously we don’t know the identity of the person who made this kind offer! We hope that he/she will step make him/herself known on reading this blog post). Bruce and I would certainly be interested in taking part in #lis_rival2. Finally, I’d just like to note here my appreciation of all the hard work that Bruce put into the organisation of #lis_rival. When we learnt in March that we had won the funding to offer this event I had just started treatment for breast cancer. 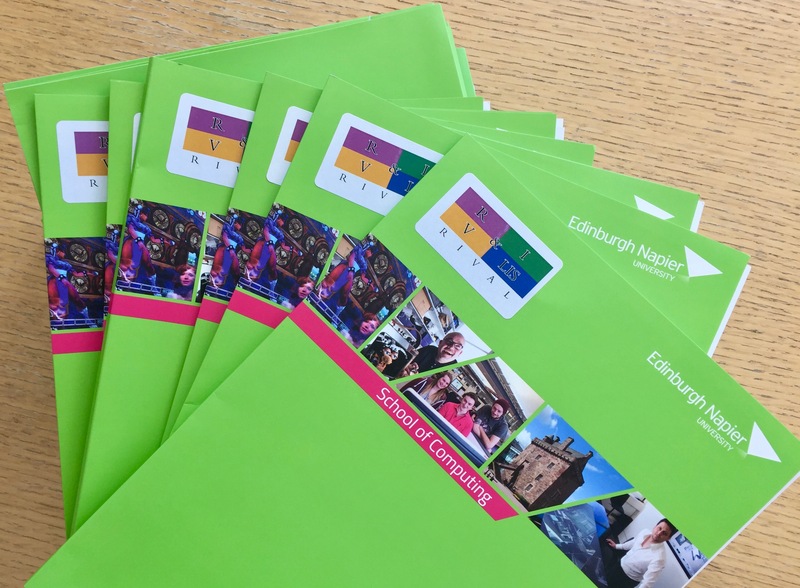 Wednesday 11th July – the day of #lis_rival – was, in fact, only my third day on campus at Edinburgh Napier University following my return to work after sick leave. Since I was away from the office in the four months prior to the delivery of the event, Bruce worked almost single-handedly to develop the programme, publicise the event, and make all the practical arrangements for the day itself (with minimal input from me at a distance from my sickbay). The high ratings in the delegate feedback are all thanks to Bruce, and I cannot thank him enough for the fabulous job he made of delivering #lis_rival. For further information about the event, please see the review on the Community, Connections, Knowledge web site (with session summaries), and the associated tweets. This entry was posted in Events and tagged #lis_rival, Alison Brettle, Andrew McTaggart, Barbara Sen, Becky Willson, Biddy Casselden, British Library, Bruce Ryan, Centre for Social Informatics, Chartered Institute of Library and Information Professionals, CILIP, conference, CSI, Denise Koufogiannakis, Developing Research Excellence and Methods, DREaM, Edinburgh Napier University, Facet Publishing, Fred Saunderson, Goldsmiths College, Hannah Spring, impact, information science, Leo Appleton, librarians, librarianship, Library and Information Science Research Coalition, Liverpool John Moores University, Maria J Grant, National Library of Scotland, Paul Gooding, Rebekah Willson, research, Salford University, Stella Wisdom, University of East Anglia, value, war poets collection, Yvonne Morris by Hazel Hall. Bookmark the permalink.